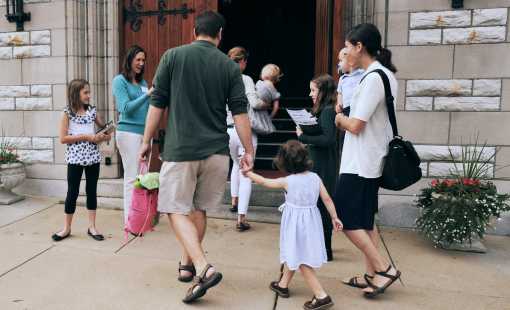 Greeters help create a sense of community in liturgical celebrations by welcoming worshippers as they enter Church, fostering a friendly, hospitable environment. This ministry creates a sense of fellowship where parishioners and guests are reminded that Sunday worship is not an individual matter, but rather a call to join together in praising and giving thanks to God. Greeters act as persons with grateful hearts, who follow the Biblical mandate, “Out of love, put yourself at the service of others”. They foster a friendly, hospitable environment by remaining alert to peoples’ needs; extending warm handshakes; and learning the names of worshippers. The time commitment is usually about about 20 minutes before Mass begins. Greeters typically serve at least one Mass per month. Melinda Seiter handles greeter scheduling. Contact Melinda to be added to the greeter schedule and to set your scheduling preferences. St. Ignatius utilizes Ministry Scheduler Pro to schedule greeters and other liturgical ministers.